The AppLife Update solution is a perfect fit for maintaining applications that operate in multi-user terminal services environments. In a terminal services installation, there are likely many users simultaneously running your application. Application maintenance solutions must account for the fact that there can be multiple instances of an application running at one time as any running instance will maintain a lock on files and assemblies that must be replaced during an update process. The AppLife Update Solution ensures that all running instances of an application are shutdown prior to starting an update, and this is accomplished through a built-in Inter-process communications (IPC) feature. The IPC employed within AppLife Update communicates across all users and will shut down all instances of an application running in a terminal services environment, making the solution a perfect fit for maintaining terminal services hosted applications. Out of the box, AppLife Update will shut down all instances of an application and allow you to update a terminal services application. There is however some customizations that can be applied to an application that is known to be targeting terminal services that will improve the users application updating experience. The AppLife Update API provides an opportunity for the integrating developer to interact with the IPC process and update initiation (starting) procedure. We can use this opportunity to improve the user experience. For the instance that initiated the update, we’ll display an indeterminate progress dialog as all instances are being shut down, and for the non-initiating instances, we’ll display an informative dialog for a short period of time indicating that the application is about to be closed for maintenance. Further enhancements could allow terminal services users to cancel the update process, or perform additional work before the shutdown. 11:          //instances of the application are closed. 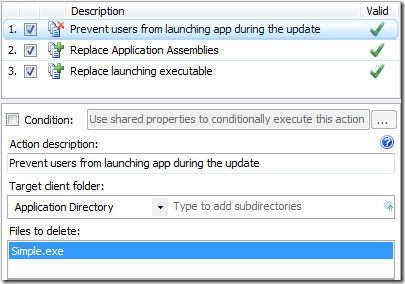 During the actual update, the application files must be unlocked, and remain unlocked throughout the process. If a terminal services users attempts to start the application using their application shortcuts, the application assemblies could become locked and prevent the update form succeeding. To prevent this, we’ll make the first action taken during the update be to rename/remove the launching executable. If the launching executable is to be replaced during the update process, we’ll perform this action as the last step of the update. By taking this action, terminal services users will not be able to launch the application during the update process from existing shortcuts.